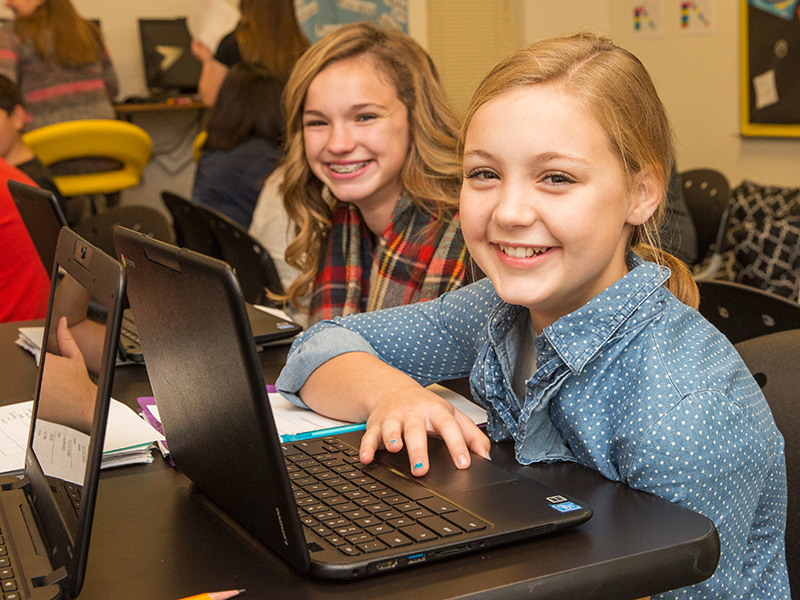 Teachers at Cisco Junior High School develop student agency through choice in weekly playlists, which include independent practice, small group instruction with the teacher, group work, instructional games and hands-on activities, and online instruction. 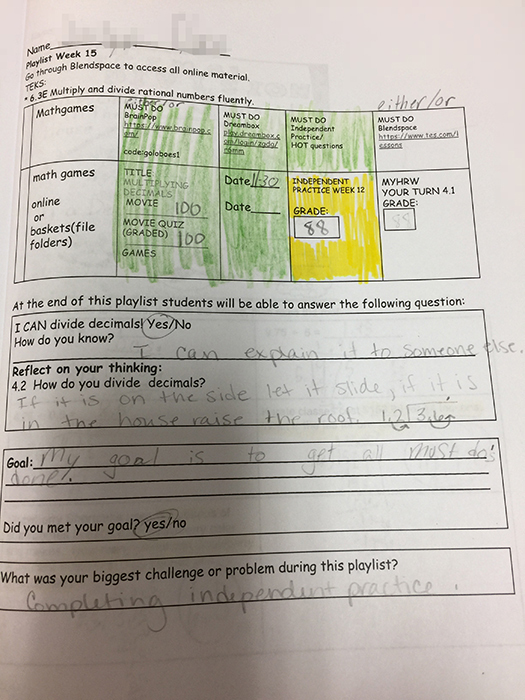 Each playlist is aligned to the week’s learning goal, broken down into both required activities and optional, extension activities. Students have choice throughout the week over which activities they want to work on, moving their name to a station on the board to indicate their selection and moving to the designated part of the room. Students are responsible for monitoring their progress and recording completion on the paper playlists, prioritizing their time each day to ensure they complete required activities by the end of the week. Students can also skip parts of the playlist by demonstrating mastery of the week’s learning goal in the pretest taken at the beginning of the week. If students show mastery, they either work on extension activities from the playlist or alternate projects that apply and deepen their understanding of the week’s learning standard. At the end of each class, teachers lead the class in a whole-group reflection, prompting each student to record their daily progress and reflect on their work. Chooses learning activities to work on from each week’s playlist. Indicates selected activity on the board and moves to the designated part of the room, also choosing to work individually or with partners. Monitors and records progress throughout the week, prioritizing and completing required activities by the end of the week. Creates aligned pretests, posttests, and learning playlists each week for each specific learning goal. Supports student learning through online playlists.